If you’re reading this, you may be interested to know that I started a new blog, A.D. Joyce–poetry and the butterfly psyche. I already have two posts up. Take a look and maybe even subscribe! Also, I have a new Twitter account, @ad__joyce, so follow me there, too. From now on, I’ll blog infrequently at Sweepy Jean Explores the World, if at all, and I will soon dismantle the @sweepyjean twitter account. So what’s the deal? Well, this blog started off as a way to stretch my limits and get rid of inhibitions as a writer. I very quickly found a way to write authentically. People loved the “Sweepy Jean” moniker but eventually I was able to be more open about who I am as a real person living on Earth. Sometimes, though, I found that I was writing myself into other boxes, fighting against the idea of branding, rejecting the notion that the “MFA” type of writing was the benchmark for good poetry, and struggling with traditional concepts of how a poet is supposed to build an audience. I’ve figured out some things but not everything, and I don’t really want to get to the point where I know it all. I truly embrace my stance as a perpetual student of poetry and life. One of the things I’ve done to try to work out the answers to these questions is a “game” I called 1 + 1 Wednesday, a weekly post I started here and eventually created a separate blog for. I invited readers to leave two words in the comment section and I did the same. The words could be related to any random thing. I saw it as a way to look at language and meaning differently and to shake up our thought patterns. Then I ran the Third Sunday Blog Carnival. Again, the idea was to promote free self expression among writers, expand our readership, and share the collective knowledge. Whereas in this blog I did a lot of explaining myself and public self analysis, my new blog will not contain much of that at all. The archives will remain here if you want to read personal details about me. Over at A.D. Joyce–poetry and the butterfly psyche, I’ll be transparent and self expressive in a way that will remain undefined, at least by me. But as always I hope you will find something there for you. 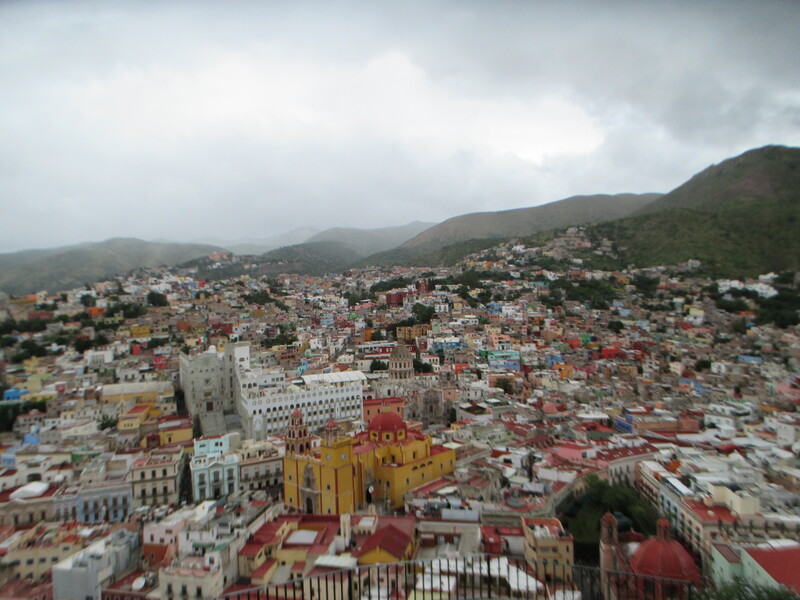 This is not an extensive travelogue and it doesn’t cover all I saw during my trip, but rather these are some really subjective impressions of traveling in and around Mexico City, Guanajuato, and Puebla recently with my 24-year-old daughter. 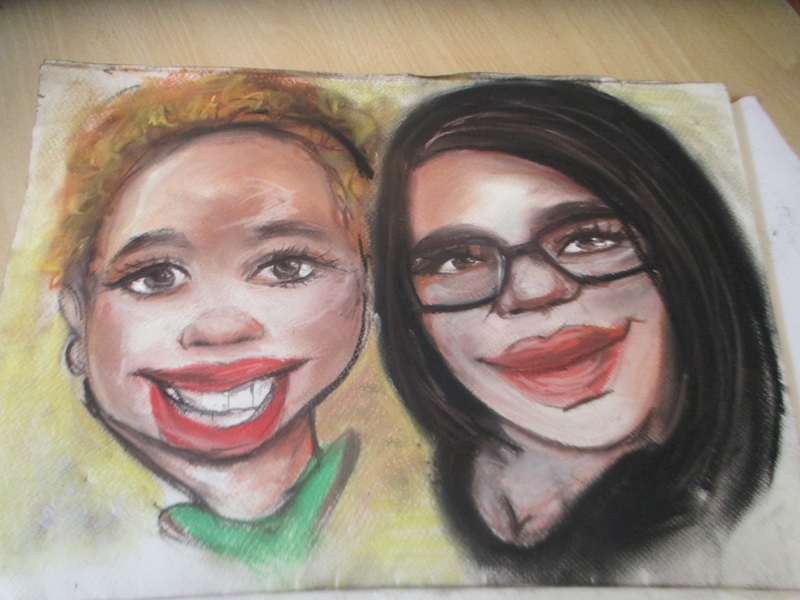 She is such a private person, and so far the only way she has allowed me to show her image on this blog is through this caricature a wonderful artist did for us. She’s beautiful and as the portrait suggests, she looks young for her age. She’s a sweetheart but don’t let appearances fool you: She’s also a tough cookie. Before getting to Mexico, I had a feeling that it would be a life-altering trip for me and I wasn’t wrong. In addition to wanting to see my daughter, I was well overdue to shake up my routine, get away from worries, clear my head, and just relax. Being around my daughter’s energy was a huge factor in helping bring me back in balance. Today is the first day of Ramadan, the month of fasting for Muslims. Among other restrictions, they take in nothing by mouth from sunrise to sunset. The time of year for the fast changes each cycle because Muslims use the lunar calendar, so next year Ramadan will start in late June. I remember when I used to participate in this fast that it was much easier to do during the winter months, and how much more difficult it was to fast during the summer months–not drinking water during the hot humid days with as many as four more hours of daylight before the fast ended at sundown, compared with the winter months. Ramadan is a sacred month for Muslims because supposedly it was the month that the Quran, the Muslim holy book, was revealed to the prophet Muhammad. It is believed that during the month of Ramadan, Satan and his minions are locked up behind the gates of hell and they can’t get out to perpetrate evil in the world until the month is over. The implication, if you believe such things, is that because Satan is out of the picture for the month, any evil that occurs during this time comes strictly from the hearts of humankind. There is nothing else to blame. Also, it’s a window of opportunity where every good deed takes on that much more significance. This whole idea has always intrigued me. I used to imagine, and even now, though I don’t practice the faith anymore, that the world feels a little less oppressive during Ramadan, and at the end of the month, which this year will be around August 7, I’ll sense the world settling back to business as usual. Not for nothing. Really. Just wanted to share that. I continue to be intrigued by this idea of post racialism and am still trying to figure out exactly what that looks like. Some people are afraid, and rightly so, that post-racialism means that we all will start to look and talk the same and that our identities will dissolve into a common, post-racial culture. Indeed, there are some who would rather not acknowledge people’s differences because it makes them feel uncomfortable. One day, I looked out into sea. Be so angry. I said, “Stop. Purpose, to live together as one. Shore to embrace the sand. not much can be known. I’d rather be gutted than lied to. The depths are as infinite as the sky. Life is a gas, not a solid. © Sweepy Jean and Sweepy Jean Explores the (Webby) World, 2009-2018. Unauthorized use and/or duplication of this material without express and written permission from this blog’s author and/or owner is strictly prohibited. Excerpts and links may be used, provided that full and clear credit is given to Sweepy Jean and Sweepy Jean Explores the (Webby) World with appropriate and specific direction to the original content.